Host a team building event on USA 76! That’s right! USA 76 is the sight of one of the best San Francisco team building activities you can experience. This fast and aerodynamic racing yacht is the ultimate form of team building and way better than any offsite on land. When you book a team building experience, your colleagues will get the opportunity to hoist the sails, helm the yacht and hone your communication skills. We can host anywhere from 8 – 20 guests on USA 76 and partner with other large yachts on the bay to accommodate groups of more than 20. Bay Challenge – the ultimate team-building exercise. This is a three-hour tour that is a timed race course around SF Bay. After our coaches greet you at the docks, your team will be assigned specific roles that will be integral to getting the boat around the race course. Communication, teamwork, and desision making is all a part of the Bay Challenge. Corporate Team Building – A corporate team building event is the best way to gather your team for a thrilling sail around the Bay. This is not a timed course so it’s a bit more relaxing though no less exciting. Your group will have the opportunity to steer the yacht, use our “coffee grinders” and hoist the sails. You can book a corporate team building event any day of the week. Sunset sails and Friday Night Races during the summer are popula. Private Yacht Charters – Do you want to impress your clients? Nothing wows visitors to the Bay Area than a jaunt around Central San Francisco Bay aboard the “Formula One race car” of the water. For every sail, we follow the wind and can sail anywhere. This includes the San Franciso or Sausalito City fronts, past Alcatraz and under the Golden Gate or Bay Bridge. USA76 is a multi-million dollar yacht and her racing pedigree makes her an incredible piece of history. You can “own” her for the afternoon when you charter her for an event. “Our entire Management team loved LOVED this team building. Our guys who flew in from Israel for this event will be the biggest fans and promoters of ACSailing in Israel going forward. Seriously. Book your team building event in San Francisco for the 2019 season now. Warren Allen at 619-630-6383 or warren@acsailingsf.com to book your team building event today. As we established in the previous post, the Louis Vuitton Cup was established as the “playoffs” for America’s Cup to determine what nation would challenge the 2003 defender. Of the nine events that Louis Vuitton sponsored, five of the prevailing challengers went on to win the America’s Cup that followed. From 2004 to 2007, the Louis Vuitton Cup was diced into “Acts” to narrow down the competition and talent that followed the “Auld Mug” around the world. These Acts consisted of thirteen fleet and match races that were held in multiple countries. A total of twelve teams, 200+ elite sailors, representing nine nations competed. Each Act would reveal a winning team that would accrue points ultimately earning the title of Challenger of the 32nd America’s Cup. The reigning defender and winner of the 31st America’s Cup was the Swiss Team Alinghi of the Société Nautique de Genève (Switzerland). Alighini brought the Cup to Valencia Spain for the 32nd America’s Cup and would compete in all 13 Louis Vitton Acts alongside the challengers. Over the course of the Acts, Alinghi held a strong lead, including winning the ACC Championship in Act 5. By the end of the second year of the Acts, Alinghi was at the top closely followed by “The Big Three”, Oracle BMW Racing, Luna Rossa, and Emirates Team New Zealand. During Act 8, in Sicily, the French Team K-Challenge knocked Alinghi out of it’s 31-race winning streak. Swiss Alinghi races on the fourth day of match racing of the Louis Vuitton Cup Act 12 regatta off the coast of Valencia, 25 June 2006. Photo credit should read JAIME REINA/AFP/Getty Images. Acts 9 – 13 brought festivities back to Valencia where the 2007 America’s Cup would take place. The final, 13th Act (originally dubbed the 14th Act so as to avoid an unlucky 13th race but called the 13th act at the end to avoid confusion) was riddled with carnage. Italy’s +39 was dismasted and Oracle BMW Racing’s spinnaker pole was snapped in half. At the end of 5 days of racing, Emirates Team New Zealand was victorious and moved on to challenge Alinghi during the 32nd America’s Cup. Italy’s +39 Challenge is dismasted during the final Acts of the Louis Vuitton Cup in Valencia. Team Emirates New Zealand wins the Louis Vuitton Cup and moves on to challenge Alinghi for the 32nd America’s Cup. As we delve further into the history of America’s Cup we come across numerous Challengers, sponsors, and athletes that have sought to leave their legacy alongside America’s Cup. One such sponsor is Louis Vuitton. Of course, the only thing sexier than high fashion is multi-million dollar yachting. It only made sense for luxury’s finest to enter the scene in 1983. Advertisement for the Louis Vuitton Trophy and the 35th America’s Cup held in Bermuda. Since it’s inception, there was an onslaught of international challengers vying for a chance to claim the “Auld Mug”. This popularity spurred the launch of the “Challenger’s Cup” which became the “playoffs” of America’s Cup. The Louis Vuitton Cup sought to narrow the competition in nine round-robin points accruing phases. The team that won the Louis Vuitton Cup would go on to challenge the current holder of America’s Cup. The first Louis Vuitton Cup was held in Newport Rhode Island. Australia II won and went on to challenge America’s Liberty for the 25th America’s Cup. Louis Vuitton sponsored a total of eight America’s Cup Events. This included one Louis Vuitton Trophy in 2017 that determined the 35th America’s Cup Challenger. Of the nine events sponsored by Louis Vuitton, five of the victorious teams have gone on to win America’s Cup! In 2003, Auckland New Zealand set the stage for the 6th Louis Vuitton Cup and the 31st America’s Cup. Team New Zealand of the Royal New Zealand Yacht Squadron was the defending champion. Skipper, Dean Barker, was at the helm. There were nine competitors from six nations with their most talented and elite sailors on board. Team New Zealand’s crew positions for the 2003 America’s Cup held in New Zealand. Enter Oracle BMW Racing and USA 76! The team was founded by Larry Ellison and skippered by Peter Holmberg. The team included elite sailors like our very own Brad Webb, Paul Cayard, John Cutler, Phil Jameson, Brian MacInnes, Cameron Dunn, and Chris Dickson. In accordance to class rules, the yacht boasted 40,000lbs of lead ballast, 10,000 lbs of carbon fiber, and 2,8000 sq ft. of sail area. After a series of nine round-robin races, Team Alinghi went head to head with Oracle BMW Racing. It was a ferocious fight, however, Alighi won and went on to challenge Team New Zealand in the 31st America’s Cup. The team prevailed and brought the “Auld Mug” back to Europe. The 2007 America’s Cup would take place in Valencia Spain. Take a look at the clip below to see some of the action between Alinghi and Team New Zealand. Larry Ellison is at it again with SailGP – a fleet of cutting-edge 15-meter catamarans that are predicted to exceed the 50-knot barrier while foiling. With its 24-meter wingsail, foils made of high modulus carbon fiber, and rudders made of high strength stainless steel – these boats will fly. Foil rake, cant, wing twist and jib sheets are all battery powered and there will be a flight control system that will be operated by a joystick. Onboard cameras and microphones will give the audience the feeling as though they were in the cockpit calling tactics. A series of five match races across four countries will end in a winner takes all 1-million dollar race. SailGP will launch in February of 2019 in Sydney Australia and will race in the San Francisco Bay in May 2019 (hint: tickets are already available if you want to see the race aboard USA 76). Visit their site for details – if you love sailing as much as we do, we know you’ll want the details now. SailGP’s F50 catamaran’s in action. The 31st Trans Atlantic Race from Newport, Rhode Island to Cowes, England. This 2,960 nautical mile race is one of the longest yacht races open to both professional and amateur racers worldwide and is organized by Royal Yacht Squadron, New York Yacht Club, Royal Ocean Racing Club, and the Storm Trysail Club. The last Trans Atlantic race took place in 2015 with 38 competing yachts including the renowned Comanche that set a set a new record by sailing 618.01 miles in 24 hours, and became the first monohull to break the 600-mile barrier. The 2019 Trans Atlantic Race kicks off on June 25, 2019 so stay tuned for details. Another Season of Sailing on San Francisco Bay! With the arrival of a new year and the promise of steady winds on the horizon, we can’t help but look forward to the 2019 sailing season (we know it’s not an event so don’t @ us, please). This year we will witness the Annual Three Bridge Fiasco in January, the 55th Edition of the Rolex Big Boat Series in September, and our beloved Fleet Week in October. Combine that with weekend regattas in the spring and daily beercan races in the summer and you have the perfect combination of fun! San Francisco Bay, SF skyline and the 2016 Three Bridge Fiasco racers. Additionally, ACsailingSF will be participating in the Golden Gate Yacht Club’s Seaweed Soup Regatta (mid-winters). We will also participate in the South Beach Yacht Club’s Friday Night Series in the summer. During the height of our sailing season, you can book a public sail almost every day of the week. If you want to schedule a private or corporate event to enjoy the bay let us know. We love to share our favorite season with you! So, keep your eyes and ears peeled for some exciting events on the Bay this year. We’ll see you out there! The next time you are on the water, keep an eye out for the US Olympic Sailing Team! That’s right, the Facility for Advanced Sailing and Technology (FAST USA) has set up shop on Treasure Island. FAST USA is a partnership between US Sailing (the sport’s governing body), the St. Francis Sailing Foundation, and the Treasure Island Sailing Center (TISC). The program’s facilities were donated by our very own ORACLE TEAM USA. Olympians past, present, and future have flooded the Bay since May 2018. San Francisco Bay has been a world-renowned sailing destination, helping to write the history of the sport for decades. Many professional sailors have found their beginnings in our cool waters. SF Bay’s consistent winds and constant tides provide a year-round challenge making it an obvious location for Olympic training. This facility is the first West Coast training facility for the US Olympic Sailing team. “Having a home is so important,” says Malcolm Page, two-time Olympic gold medalist and Chief of US Olympic Sailing. “I think it’s a huge step forward for this country and for sailors who want to reach the top of the podium. I think it’s really going to set ourselves up. To think the L.A. Olympics are only 10 years away, it’s a great opportunity,” says Page who moved to the Bay Area to manage the facility. The completed facility will be located on the shoreline of Clipper Cove nextdoor to the Treasure Island Sailing Center. The Cove provides a sheltered area for dingy and keelboat sailors alike. Already, TISC works hard to bring sailing to the Bay Area community all year long, successfully running their Set Sail Learn program that offers thousands of fourth-grade kids an opportunity to get out on the water. With the 2028 LA Olympics just 10 years away, this cutting-edge training facility will help increase the headcount and performance of the US Olympic Sailing team. We’ll hope for more medals as well! Like any story, we have to start at the beginning. Before foiling monohulls, multihulls, spinnakers and carbon fiber. This story begins even before J-Class yachts made their debut in the yachting world and in a time where the crew positions included physically move ballast below-decks from one side of the hull to the other during tacks. The inception of America’s Cup all started in Hoboken, New Jersey in 1851 with John Cox Stevens, the first-ever commodore of the New York Yacht Club. He didn’t know it at the time, but the 101ft schooner, America, he’d commissioned by Geroge Steers would lead to what has been called the world’s oldest sporting championship and a 167 year-long legacy of innovation, competition, and skill. Stevens grew up the eldest son of a Revolutionary War veteran and steamboat pioneer in Jersey. After building a series of his own yachts, founding the New York Yacht Club, and introducing Cricket to America, Stephens had a thirst for something more. He gathered a 6-person syndicate to commission the building of a magnificent schooner to be a competitive Yankee thoroughbred in British waters. On August 22, 1851, a mere 4 months after her launch, America was set to race in Cowes against 15 of the finest yachts and skilled crews that the Royal Yacht Squadron could muster. She was a gamble and ahead of her time. She was built for speed and featured innovative, machine-woven, flat cut sails. Contrary to the rounded bows of the era, America’s bow was concave. The design offered the least resistance to the flow of the water over her bow. And they knew she was fast. On her journey across the Atlantic Ocean to Cowes, the crew recorded impressive 200+nautical mile days. At the blast of the starting gun, 15 yachts took to the course, racing to defend Britain’s honor. It was a quick 54-nautical-mile race circumnavigating the Isle of Wight. The prize was the “Auld Mug” or the “£100 Cup”, a 27-inch cup made of 134 ounces of silver and worth £100. There were no handicaps and sources say a south-westerly wind prevailed, aided by a strengthening east-going tide. Bets were heavily in favor of Stevens’ Yankee schooner. The “Auld Mug” or “£100 Cup” was renamed “America’s Cup” in 1851. The “Auld Mug” was claimed by the Yanks and renamed the “America’s Cup”. Shortly after her victory, Stevens sold America. However, the legacy of the yacht remained intact. In 1857, the challenge for America’s Cup was declared with the deed of gift. In 1970 the very first America’s Cup Challenge on American waters took place in Newport, Rhode Island. What would follow is a 167-year-old championship that would birth some of the most innovative yachts and technologies in history. USA 76 would enter the scene in September 2004 as a Challenger in the 32nd America’s Cup the Malmö-Skåne Louis Vitton Cup. Among the many famous sites that make San Francisco Bay a popular tourist destination, you will find Alcatraz Island. Otherwise known as “The Rock”, the island juts out of the blue waters of the Bay, barren and sharp against the rolling California hills in the distance. As the turbulent and cold waters of the SF Bay splash on the rocky shore, it’s not hard to understand the appeal of secluding the nations most dangerous criminals on the small island. Juan Manuel de Ayala, a Spanish explorer was the first person to map the rugged Island in 1775, naming it La Isla de los Alcatraces or The Islands of the Pelicans due to the large population of birds that inhabited the land. 75 years later, the US military built a fortress that housed 100 cannons and the West Coast’s first operational lighthouse. After almost a century, the US Justice Department opened a maximum-security federal prison on July 1, 1934. The prison housed the most disruptive inmates in very harsh conditions. At any given time, Alcatraz would host 260 to 275 prisoners with approximately 1 guard to every three prisoners. During its 29 year reign, Alcatraz Federal Prison housed many infamous criminals. Al “Scarface” Capone, murderer Robert “Birdman of Alcatraz” Stroud, and George “Machine Gun” Kelly all spent time at Alcatraz. Gangster Alvin “Creepy Karpis” Karpowicz, who was Public Enemy No 1 in the 1930s, also spent time in Alcatraz. 36 inmates attempted 14 escapes. Twenty-nine of these escapee wannabes were killed or captured while attempting their getaway. Of the prisoners that tried to swim to shore, two drowned and five went missing. Their bodies were never found. Officials presume they drowned fighting San Francisco Bay’s violent currents. The prison shut its doors in 1963 and became a part of the Golden Gate National Recreation Area in 1972. The prison opened to the public in 1973. Today, Alcatraz remains a popular tourist attraction. Every year, millions of tourists visit San Francisco hoping to get an in-person view of “The Rock”. Annually, hundreds of people willingly participate in the “Escape from Alcatraz Triathlon” every June. This race includes a chilly swim from Alcatraz to Crissy Feild with chase boats for safety. There are several ways to get a good view of this historical site. Book a Day or Express Sail past the island on USA 76 for a quick cruise if you are short on time. If you would like to tour Alcatraz by foot, book a day or a nighttime tour of the prison with Alcatraz Cruises. One again a new year has started for USA 76 with a promise of fair winds and an active racing schedule. The ACsailingSF crew are excited to share with you the experience of racing one of the fastest sailboats in the San Francisco Bay. Join us on one or all of our races listed below and become a part of USA 76 race team where you will have the opportunity to drive the yacht, work “coffee grinders” which trims the sails, and, be a part of the crew. We are happy to have hosted Omega Watches aboard USA 76 once again to sail with us on San Francisco Bay for a team building event. 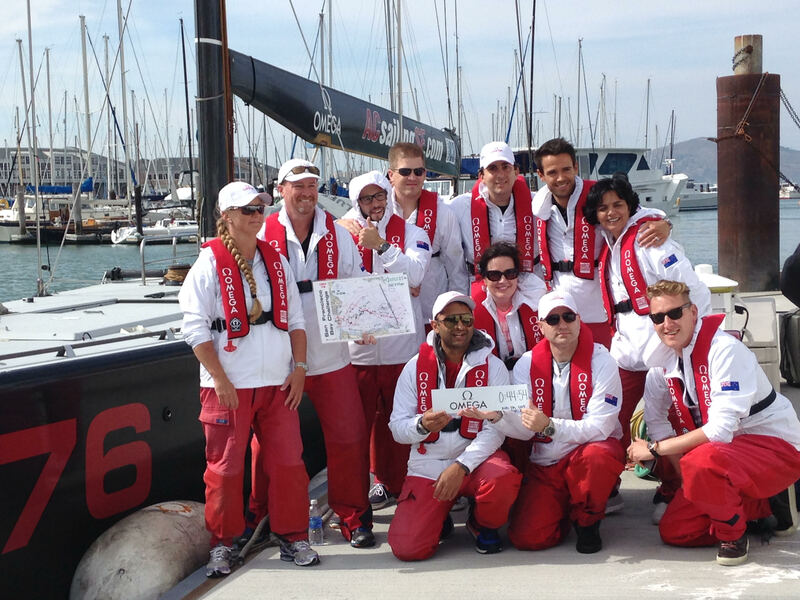 Omega sailed back to back yesterday in two attempts to top our SF Bay Challenge leaderboard. 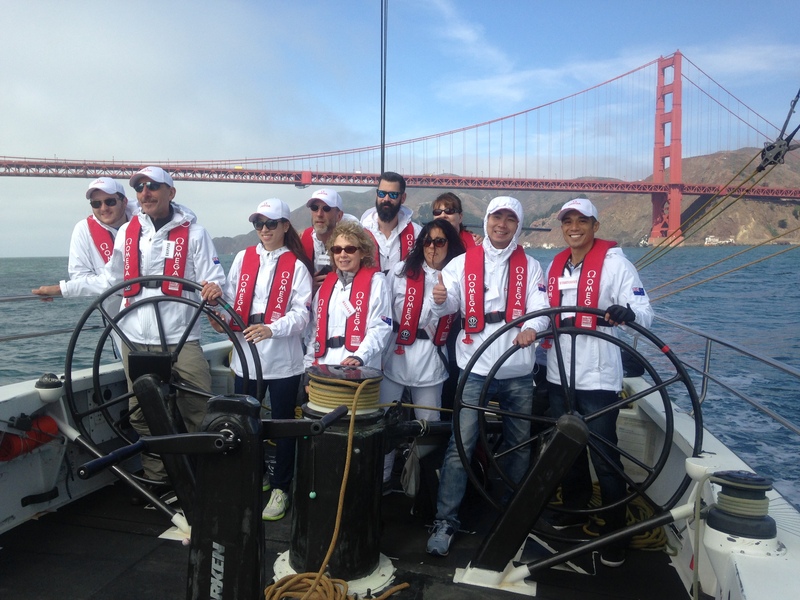 The timed race event was a special outing for Omega ambassadors to enjoy San Francisco Bay while focusing on teamwork. Success is only achievable if the group performs as a whole with effective communication on board the yacht. This requires stepping outside of one’s comfort zone and learning through active participation. Very few of our sailors had any prior experience in yacht racing, but were able to immerse themselves and learn with the tools and advise the ACsailingSF team provided. Both the morning and afternoon groups were successful in achieving fast times while sailing on the America’s Cup race course here in San Francisco. Have a group that wants to take the team building Challenge? We’re more than half way through the summer series — the South Beach Yacht Club’s Friday night beer can racing. USA 76 has lined up with local racers for pleasant evenings racing the course down by the SF Giant’s Stadium (we even managed tv footage a couple times!). All of our guests aboard have helped race USA 76 with great enthusiasm, making for very memorable races. USA 76 was amongst the festivities once again this year. The fireworks sail is amongst our most popular events of the year. We sailed under the Golden Gate Bridge as the sun was setting, then dropped sails and enjoyed a very up-close viewing of San Francisco’s fireworks show from the water. The 4th also marked the 13th birthday of USA 76!